A new spin on a holiday pie, sweet potatoes and dark chocolate pair perfectly, lightened up with beaten egg white for a light, chiffon texture. Place the ginger snaps in the food processor and finely grind. Place in a large bowl, drizzle over the melted butter and work through. Prepare the pie dish; brush with melted butter, and press the ginger snap mixture firmly around the base and sides. Place in the fridge to firm up. Melt the chocolate, place in a double boiler and melt gently over low heat, set aside. Place the sweet potato in a food processor or standing mixer. Add the egg yolks, softened butter, coconut milk brown sugar, salt and spices, and beat or process until well incorporated. In a separate bowl, beat the egg whites until foamy, add the white sugar and continue beating until stiff, but not over beaten. Transfer the sweet potato mixture to a large bowl, and mix in one third of the egg white to lighten it up. Gently fold in the remaining egg white, being careful not to break it up too much. Dollop the mixture into to pie shell, and gently smooth over the top. Bake at 35o F for 15 minutes, lower the heat to 325F and bake a further 30 minutes. Switch off the oven and allow the pie to rest in the oven at least another hour, this helps ensure the pie does not crack. 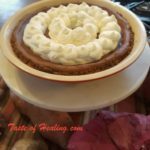 Allow to cool, garnish with slightly sweetened whipped cream and serve. Roasting the sweet potatoes for this recipe further intensifies the flavors; simply place the whole sweet potatoes on a roasting pan, and roast until soft to the touch, 30 minutes to one hour depending on the size. Allow to cool, peel away the skin and mash. This recipe yields one large 12 inch pie, or two smaller.